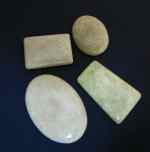 Avgemstone variety of chalcedony containing small quantities of nickel. Apple-green & deep green in color. Composed of fine crystals not seen as distinct particles under normal magnification. unlike rock crystal, amethyst, citrine.